We’re now using Babel to transpile our code. That means that we had to make breaking changes, please take a look if you have to make some adjustments in your implementation before moving to this version. The Bootstrap CSS files were merged to Handsontable’s default CSS. Some global variables were reorganized and/or removed. Please take a look. Changed the way in which custom cell types are being registered. We improved the public API to give developers an ability to register cell behaviors and types separately. We strongly recommend to use a registered alias in Handsontable settings to increase the code maintainability. Fixed documentation for the cells config option (#4185). Fixed a problem with the maxRows functionality (#4180). Fixed a problem with the maxCols functionality (#4156). Fixed a bug, where entering integer values to a dropdown caused the cell to be marked as invalid (#4143). Added the TypeScript definitions to the repository (#4112). Fixed a bug with getCoords throwing an error when used on non-cell elements (#4074). Data copied from the table will no longer have a newline at the end (#3801). Fixed a problem with scrolling on IE9+ (#2350). Fixed a wrong variable in a listener of the mouse wheel event (#4255). Fixed an issue related to defining a cell metadata for non-existing cells (#4024). 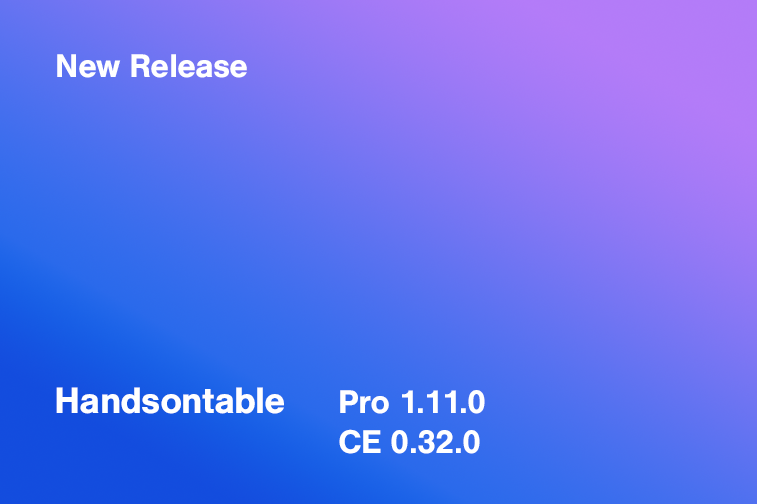 The corresponding Handsontable Pro version is 1.11.0. You want to be up-to-date with all our updates? You will always find fresh updates on our Twitter profile. We appreciate all Github issues and emails which helped us fix issues in the current release. Leave a comment or contact us to help us make Handsontable even better.